This article focus to Define and Discuss on Stream Deposition. A stream’s sediment load is normally deposited, tough, and redeposited many times in a stream waterway, principally through climatic variations such as flooding. 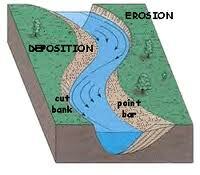 Sediments are deposited throughout the duration of the stream as bars or floodplain deposits. Here briefly discuss on Bars, Floodplains, Alluvial fans, Deltas. Explain also Topset beds, Braided streams, Meanders and oxbow lakes.